I recently got this great body butter recipe from a friend and love it. It is so easy; great for your skin; inexpensive; and completely natural. Try it for yourself. 1/2 cup coconut oil (I purchased mine from Wilderness Family Naturals or Tropical Traditions). Click here to find out all the great health benefits of coconut oil. 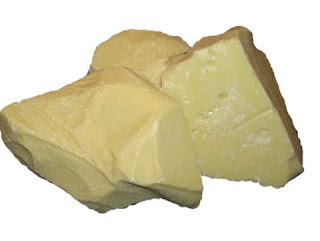 1/4 cup cocoa butter (I purchased this from Mountain Rose Herbs) Cocoa butter is a very stable fat containing natural antioxidants that prevent rancidity and giving it a storage life of two to five years. The moisturizing abilities of cocoa butter are frequently recommended for prevention of stretch marks in pregnant women, treatment of chapped skin and lips, and as a daily moisturizer to prevent dry, itchy skin. Add your favorite essential oil until you get the desired strength. (I used lavender...I love lavender). This is such a great moisturizer. I use it on myself and my kids after their baths and it feels so clean and safe! I am definitely going to try this! I have cocoa butter and I've just ordered a 2L coconut oil (I'm very much into coconut oil these days), so the only thing I need is the essential oil... I even have containers! I suppose you just melt the oils over low heat, mix in the essential oil, pour and allow to cool? Yes Hanlie! I wasn't very clear on that. I heat the oils on very low heat as the cocoa butter is a little tough to mix and then as it's cooling I add the essential oil, mix, and pour into a container. I will definitely try this. I have been using coconut oil since 2011. and it has changed me in amazing ways. I love to use coconut oil for cooking. I always buy my coconut oil form pancake organics.